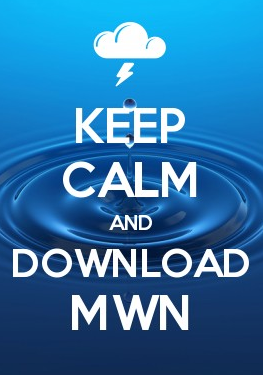 MWN Blog: #StupidHot continues... but for how long? The NWS has extended the Excessive Heat Warning through Friday for the pink counties in the map below and the Heat Advisory for everyone through Saturday. Heat indices will likely exceed 110° again on Friday afternoon with lows only near 80° tonight. Anyone else tired of the seemingly never-ending, sauna-like heat embracing the Mid-South in a big sweaty hug?? Late this morning, the National Weather Service (OK, they're just the messengers, it's Mother Nature's fault) poured salt on the wound with the upgrade of the ubiquitous Heat Advisory to the insufferable Excessive Heat Warning for most of the metro. (See the third-degree sun-burnt color on the map below.) 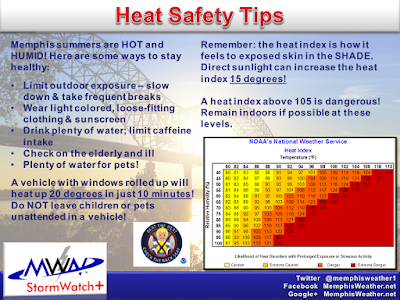 Besides just being "Memphis summer" hot, heat indices above 110° are making it #StupidHot today thanks to the sauna door being left open, allowing disgusting levels of humidity to pour into the region. 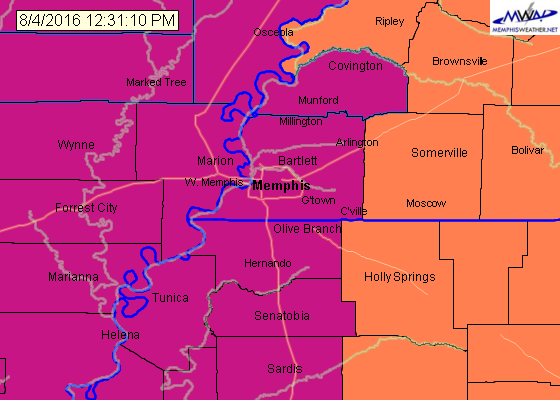 An Excessive Heat Warning for heat indices above 110 is in place through Friday for the dark pink counties. Orange counties are under a Heat Advisory with heat indices of 105-109. 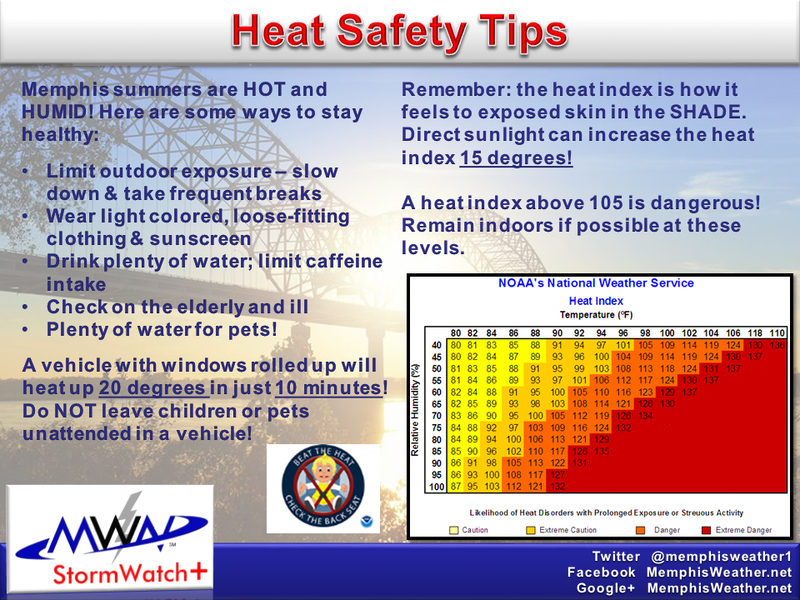 A Heat Advisory will the entire metro continues into Saturday. In all honesty, I shouldn't be making light of the situation. Speaking of the "cooler" parts of the day, morning lows in the metro have been very warm. With dewpoints (a direct measure of atmospheric moisture) hovering in the mid 70s lately, low temperatures have been in the upper 70s to near 80. In fact, after the 7th warmest June and the 8th warmest July on record (which, combined, tie for the 4th hottest June/July ever), we're in the midst of a streak that speaks directly to the lack of relief from the summer heat wave. Today marks consecutive day #55 in which the low temperature has not fallen below 70. 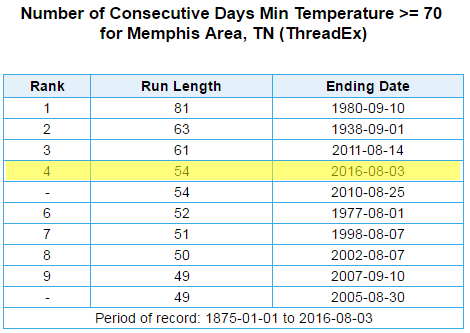 That is the fourth longest such streak on record in Memphis. So how far up that ranking will we go? I hate to say it, but spot #2 looks entirely possible, which means at least another week-plus of very warm weather. Upper level high pressure looks to hang on well into August with above normal temperatures forecast through at least mid-month. 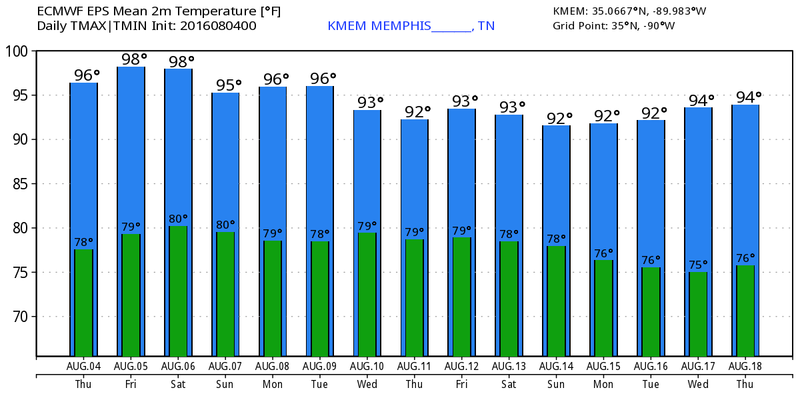 Medium-range models that provide hard numbers out to 10 days suggest lows no cooler than the mid 70s through the 10 day period with highs remaining in the 90s. The European model forecast of high/low temperatures for the next 10 days shows little relief from the heat. Numbers are approximates, but are useful for trend analysis. Graphic courtesy WeatherBell. The only relief likely for the next couple days will come in the form of widely-scattered to scattered showers and thunderstorms that provide temporarily cooler conditions but, oftentimes, increased humidity. A slight weakness in the upper level ridge and approaching cool front this weekend looks to provide slightly better chances of thunderstorms Saturday and Sunday, but with humidity remaining high, temperatures will remain warm at night (70s) and hot during the day (90s). Early next week could see slightly reduced dewpoints, which could allow overnight lows to be a few degrees cooler. At this point, I'll believe it when I see it! In the meantime, I'm waiting for September when even "above normal" could mean highs in the 80s!